My husband and I planted a church several years ago, and the beginning stages were really exciting. It was a time of passionate vision, excitement about possibilities and anticipation about what God would do through our community. How can I give away something I’ve never received? As the first few months went on, despite the books, conferences, and podcasts on discipleship we were consuming, we quickly became aware that we had no idea what we were doing. I was struck that no one had ever intentionally come alongside me to disciple me—to show me the way. And then I found out I wasn’t alone. This was the reality I was bumping up against. Despite the fact that Jesus’ last words to us were to make disciples, most of us have not experienced an intentional discipling relationship. We have not had someone who has walked alongside us to help us be with Jesus, to learn from him on how to be like him. After wallowing in self-pity for awhile about this (something I’m frequently tempted to do! ), I resolved that the cycle of non-discipleship would not continue through me. Shortly after I made my resolution, a friend invited me to be part of a discipleship group she was starting. 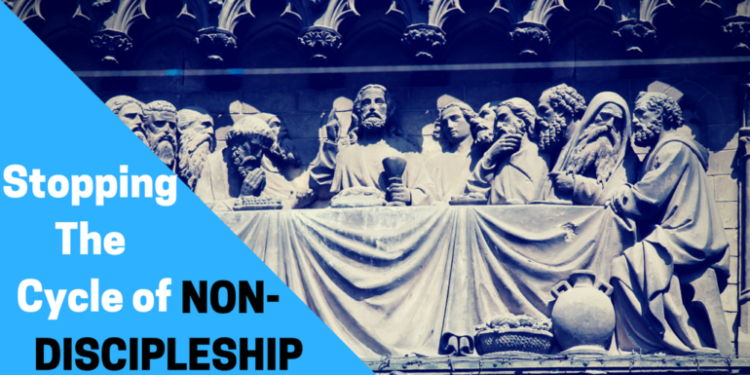 Looking back, I grew more in that year of intentional discipleship than I ever had before. After that season, I began to intentionally disciple others. And I’d love to say that it led to a season of fabulous breakthrough, church growth and amazing change in our lives. But it was more a mixture: of struggle, breakthrough, wrestling, growth, trial, and error. God is always present and at work. He uses the everyday situations of life to grow us more and more into the image of Jesus. And he invites us to participate with him in this work. Where is God present and at work in our lives? Where are the high points? Where are the low points? These are the places where God is seeking to meet us. 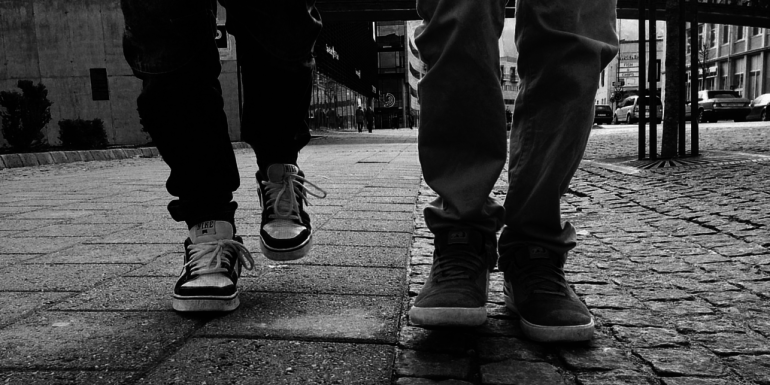 Today, where can you be intentional in helping your path cross with those you’re discipling? Eating together? Texting to ask how someone’s day is going? How can you connect this week? The good news is that we don’t have to be a perfect example, just a living one. Actually, leading from a place of “I have all the answers and everything figured out” is a recipe for disaster. Jesus is the only perfect example; so we look to him and follow. His promise to us is that in our weakness, he is strong (2 Cor. 12:9). His power is made perfect in our weakness. So being weak is the only pre-requisite! Today, how can you release the pressure to be perfect and have it all together? What ways can you lead in the midst of your weakness? Being vulnerable is essential in discipleship. And not just for the person we’re discipling, but for us as well! Our vulnerability gives permission to others to be vulnerable. It sets the stage, opens the door and helps people know the call isn’t to perfection. Shame wants us to hide our imperfections because it says it’s the only way we’ll truly be loved, wanted, valued and accepted. Being vulnerable paves the way for others to be honest about their struggles. This is the place where God’s power meets us in mighty ways, bringing connection, healing, and freedom. Today, what can you share about your life that would help pave the way for vulnerability? I’m still figuring out what it looks like for me to disciple others with my personality, stage of life and gifting in mind. Honestly, I’m learning more and more that discipleship is not a cookie-cutter process that we can just tell others to copy exactly for immediate, instant results. He invites each one of us to follow him, and this involves being a disciple and making disciples. He will equip us for this call, even if we’ve never been directly discipled ourselves. I’m thankful today that He promised to never leave us on this journey of discipleship! I had an opportunity to share on the V3 blog about Ministry’s Most Commonly Forgotten Secret. What I really needed was rest. When planting a church, one of the easiest things to be put on the back burner is the need for rest. It’s essential to take a break from our work. If we neglect this, we have the candle lit at both ends and will end up burning out. See, that’s the thing. For many planters, life feels completely filled to the brim. We know we need to take a break, but we struggle to have an imagination for how that actually happens. The rigorous schedule, constant pressure and lingering anxiety can be a vicious cycle that we easily fall into. It can often feel like life is running away with us. This was where I found myself that day when I realized it had been multiple weeks since our last day off. I knew something needed to change. We all have a calling to work to extend God’s kingdom. Equally, we have a calling to rest from that work. He invites us to work with him and he promises us rest. It’s essential to live into each of these realities and have a rhythm of both in our lives. Jesus is always our model and he lived a life of rest and work. It was a fundamental spiritual discipline that he engaged in regularly. We need to have a rhythm of life that swings fully into actual rest—where we are recreated, refreshed, restored, reconnected to ourselves, God and others. It’s then that we can swing back fully into actual work—not striving and stress-filled, but moving out in God’s power, where there is an ease to our work because of the Spirit’s power behind us. How do we live our lives in a way that swings into both worlds when planting a church? How do we not neglecting one or the other? How can we have this rhythm swinging in a healthy way? Before jumping straight to the practicals, the best place to begin is to take a look at our thoughts and beliefs about rest and work. We can have all the best plans for rest, but often something at the core still keeps us from it. If you are feeling worn out, stressed, and tired today consider: What are the thoughts behind those feelings? Just like in a car, our thoughts end up driving many of our decisions and actions. When we can identify the thoughts, we can begin the process of allowing the Lord to renew our minds. We can’t do battle with something that is nameless. Identifying the thought and belief is the first step. We may believe that rest is not productive, helpful or accomplishing anything. We may think we have to earn our down time. We feel we are being lazy if we need rest. We may see busyness as a status symbol or a confirmation that we’re doing it right, so we avoid rest. We may believe that rest is deserved only in proportion to how crazy full our life is. We may believe rest is impossible if we have young children. We may think that rest is only found on the beach with a cold soda in hand and no one else around. We may think that rest is “me” time, and that feels simply like I’m being selfish. Are there ones you identify with? When we recognize, with compassionate curiosity, the thoughts and beliefs we have about rest and work we open ourselves up to God’s empowering presence. Only then can we make space for the Lord to speak to us, heal us and bring freedom through renewing our minds. The truth that sets us free to rest is that God can handle things without me for one day. He has got this! Today consider what thoughts or beliefs keep you from resting and taking a break? What good news does God want you to know about that? How can you respond to that good news this week? I had an opportunity to share on the V3 blog about 4 Ways to Stop the Cycle of Non-Discipleship. We must be disciples, we must intend to make disciples, and we must know how to bring people to believe that Jesus really is the one. I was left with this question…. How am I suppose to make disciples when I’ve never been directly discipled by anyone? This is the reality I was bumping up against. Most of us have not had a discipling relationship where someone has walked alongside us to help us be with Jesus, to learn from him on how to be like him. Instead of wallowing in self-pity (which I was tempted to do! ), I resolved that the cycle of non-discipleship would not continue through me. 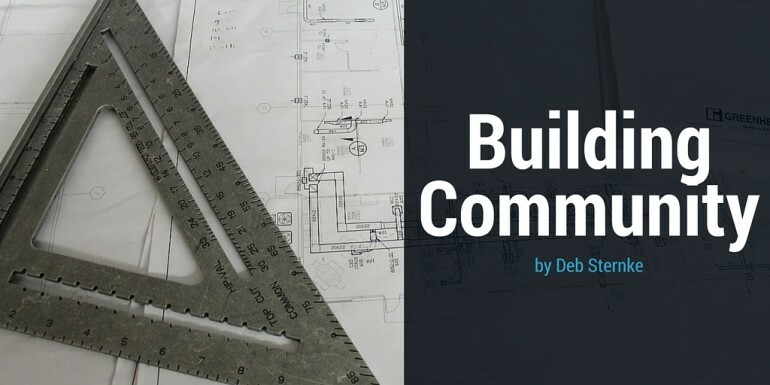 I’m excited to share this week on the V3 blog about Building Community. Building community is hard work. It takes intentionality and risk; requires energy and planning. And there is always the possibility of rejection as we put ourselves out there. However, making room for others in our lives is an essential practice for those in the community of faith. We all long for community. People are hungry for welcome. When we open up our homes to others so much more happens than simply adding to the number of bodies in our home. There is incredible power in simply welcoming people because in this simple act we are welcoming others as Christ has welcomed us. It is one way we join him in his work in the world. When we do this, Jesus is present with us. V3 is a church planting movement that desires to come alongside you as you seek to plant churches that are a sign, foretaste and instrument of God’s kingdom. Growing a movement involves having a vibrant faith, a viral hope and a concrete love. They seek to foster these through all they do: our learning cohorts, our assessments, multicultural churches and resources. The street preacher dressed to the nines on the corner, bullhorn in hand, shouting out a pointed sermon to a mass of weekend shoppers, all of whom are nervously trying to avoid eye contact. The kind, old lady attempting to pass out tracts to anyone who will slow down long enough to see what is in her little, frail hand.